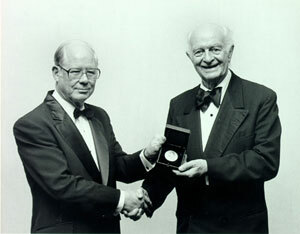 Linus Pauling receiving the Joseph Priestley Medal, the highest honor conferred by the American Chemical Society. 1984. "It is doubtful that there is another collection of one person's accomplishments and life, both personal and professional, to match this one in breadth and depth." Nancy A. Bunker, (p. 140) Primary Source Collections in the Pacific Northwest: An Historical Researchers Guide, Westport Connecticut: Libraries Unlimited, 2005. "A Prized Collection: Pauling Memorabilia," by Elizabeth K. Wilson. Chemical and Engineering News (August 7, 2000): 62-63. "This resource presents a unique historical perspective. Undergraduates reading these documents and hearing and seeing these presentations on the peace movement will gain an understanding and respect for the difficult fight for nuclear sanity decades ago." "Linus Pauling and the International Peace Movement. Internet Resource." Potter, F. CHOICE, 45-4953, (May 2008). Review of Linus Pauling and the International Peace Movement: A Documentary History. "This site will hopefully be emulated by many other libraries with important collections of historical documents." "Linus Pauling and the race for DNA. Internet Resource." Guilfoile, P. CHOICE, 41-1531, (November 2003). Review of Linus Pauling and the Race for DNA: A Documentary History. "From The Mind of Pauling", Henry Fountain. NY Times, Vol. CLI, No. 52,041 (February 26, 2002): D4. "...one of the best educational resources on the Web." Award of Excellence from StudySphere, in their "Chemistry History" section, for the Ava Helen and Linus Pauling Papers. July 2006. Pauling Centenary Exhibit awarded Exploratorium's Ten Cool Sites award. December 2001. "[Pauling's] concern for the humanitarian and ethical consequences of scientific discovery add an extra dimension of analysis for historians of science. It is fitting that his archivists have now published one of the finest catalogs for the papers of an individual scientist....The Pauling Catalogue is well worth the $125 purchase price and is a must-have for any Pauling researcher or university library." Review by Gregory J. Morgan and Emily A. Jones, Spring Hill College. Journal of the History of Biology, Vol. 41, No. 2 (June 2008): 403-406. "For the illustrations alone, nearly twelve hundred of them, anyone interested in Pauling's life should buy the catalogue . . . [The Pauling Catalogue] provides an immense amount of information about Linus Pauling and his times and will be the invaluable source of material for future biographies." Review by Jack Dunitz, ETH-Zürich, Switzerland. Bulletin for the History of Chemistry, Vol. 33, No. 1 (2008): 45-46. "The catalog is ideal for historians of science, and is engaging for browsing by chemists, students, and general readers....Highly recommended." Review by A. Viste, emeritus, Augustana College. CHOICE, 45-0288, (September 2007). "It constitutes an invaluable resource for historians of science and chemistry, scholars of science policy, and advocates of the peace movement, along with practicing chemists and scientists interested in the history of their fields, especially during the 20th century. It belongs in every academic library." Oregon State Library, Library Services & Technology Act (LSTA), $19,180 to the Oregon State University Libraries for "Development and Management of Oregon's Tribal Archives" (year two), 2012-2013. Oregon State Library, Library Services & Technology Act (LSTA), $10,795 to the Oregon State University Libraries for "Development and Management of Oregon's Tribal Archives" (year one), 2011-2012. National Endowment for the Humanities (NEH), $299,947 to the Oregon State University Libraries for "The Northwest Digital Archives: Expanding the Regional Union Database of EAD finding Aids," 2005-2007. National Endowment for the Humanities (NEH), $350,000 to the Oregon State University Libraries for "The Northwest Digital Archives: A Union Database of Encoded Finding Aids from Idaho, Montana, Oregon and Washington," 2002-2004. Oregon Council for the Humanities, $1,469 to the Oregon State University Archives for "Fighters on the Farm Front: Oregon's Emergency Farm Labor Service, 1943-1947, Traveling Photo Exhibit" (phase 2), 1994-1995. Oregon Council for the Humanities, $3,125 to the Oregon State University Archives for "Fighters on the Farm Front: Oregon’s Emergency Farm Labor Service, 1943-1947, Traveling Photo Exhibit," 1993-1994. In addition, several past recipients of the OSU Libraries Undergraduate Research Awards have either worked for SCARC or conducted their research in SCARC collections. Hannah Mahoney, A Global Affair: Understanding 1960s Geopolitics Through the World's Fair, 2012-2013. AnnaRose Adams, Response of reef fish assemblages to overgrowth of the hydrocoral Millepora complanata by the crustose alga Ramicrusta, 2011-2012. Ingrid Ockert, The Atomic Awakening of Ava Helen Pauling, 2011-2012. Douglas Schulte, How the West Was Won: An Investigation of the Rise and Evolution of the Cowboy as an American Popular Culture Icon, 2009-2010. Kristina Wick, The Free Lunch Program: A Construction of Social Welfare Attitudes of the 1940s, 2008-2009. Andrew Seher, Andrew Seher – Leading the Way to Real Progress: The Portland Urban League, 1964-1970, 2007-2008. Meaghan Josh, Albina's Story, 2007-2008. Hannah Mahoney, College of Liberal Arts Undergraduate Researcher of the Year, 2013. Laura Cray, Oregon Heritage Fellow, 2012. Mike Dicianna, College of Liberal Arts Outstanding Senior - History, 2012. Doug Schulte, OSU & State of Oregon Student Worker of the Year, Western Association of Student Employment Administrators, 2009. The Special Collections & Archives Research Center has enjoyed a long and fruitful relationship with Oregon Public Broadcasting's "Oregon Experience" documentary series. Below are the films on which we have collaborated most intensively. Each documentary is available for viewing online.